A Consultant is professional who has the competencies to provide professional or expert advices in a particular area or field. Consultant can be any from an expert of technical skills advisor to a non-technical advisor. For example, a Chartered Accountancy services firm which provides the consultancy related to accounting, finance and auditing. The other examples can be quoted as aeronautical or medical Consultant. Actually Consultant is deemed a specialized person in his respective field which can provide best solution for difficult problems or issues that a business can encounter in abnormal situations. There are two major types of Consultant namely internal and external. Internal Consultants are those who works within an organization and ready to provide their advices for the best interest of the business. While on the other hand, external Consultants are those who are not directly belong to an organization. Businesses hire external Consultants for specific time period on proposes terms and conditions. 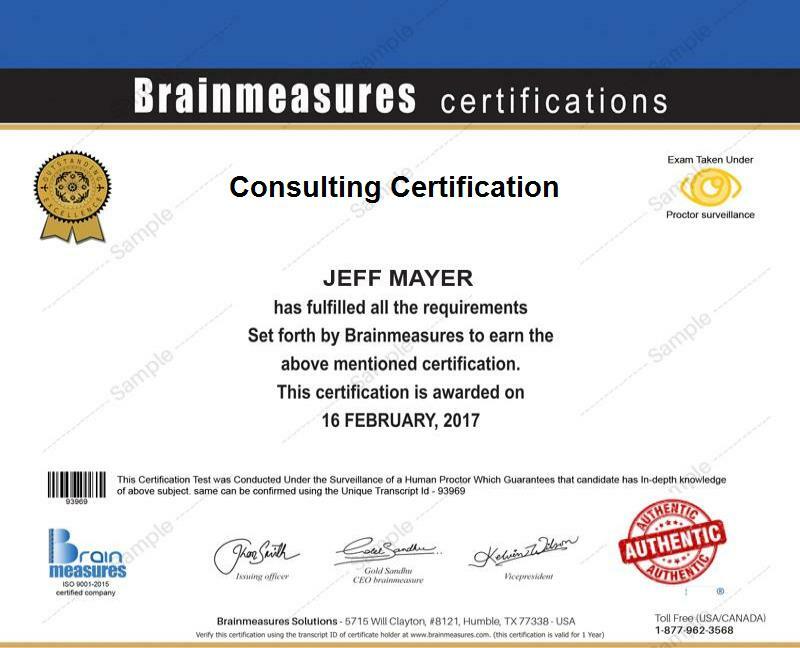 If you want to know exactly who is a Consultant and what this professional does, then you should access Brainmeasures which is a famous online platform with ISO certification to provide you the best knowledge about consultancy field. This online course is especially designed by the experts of their respective fields to mentor you about consultancy field with aim to develop your mental and motor efforts about how to become a successful Consultant of your own field. The course is elegantly design which covers all important aspects and stuff. Apart from the course outline and detailed syllabus, your expertise and knowledge will also be assessed through an online exam after which you will be awarded the prestigious certificate of Consultant from Brainmeasures. Working as a Consultant of your area of concern after earning your Consultant certification is also proven to be really rewarding considering the fact that it significantly increases your salary or wealth. As a Consultant of your respective field, you can earn around $70,000-$120,000 which may increase further depending on your level of expertise, experience and demand in the relevant field. The Consultant certification program which is now available at Brainmeasures is extremely beneficial for all those who plan of becoming part of the consulting industry with regards to their relevant consultancy areas (i.e. accountancy, medical, engineering etc.). It caters to the needs of all aspiring Consultants who wish to improve their knowledge and skills in improving the clients’ satisfaction with specialized services. The good thing about Brainmeasures is that it does not set standards and requirements for those who plan on becoming part of their programs so anyone can be admitted into its Consultant certification program without any hassle.